The University spent about $390,000 to provide police security in McCorkle Place — the oldest part of the campus and home to the Confederate statue Silent Sam — from July 2017 to the end of June. 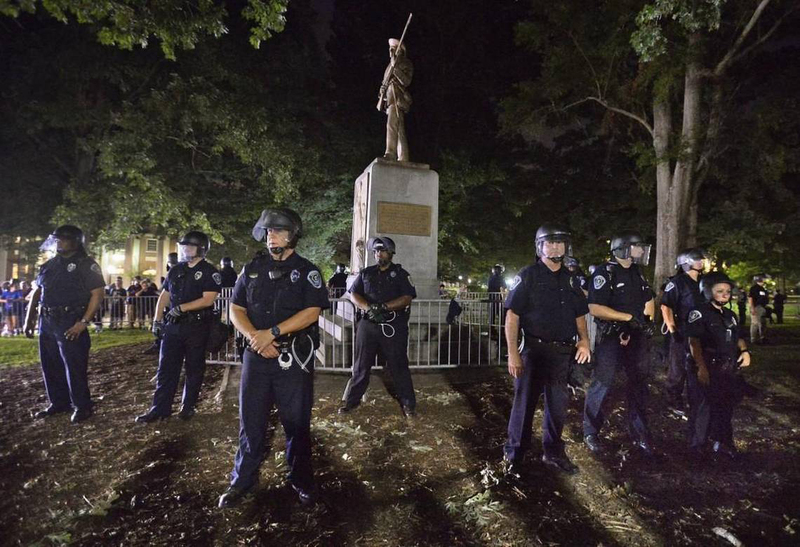 Though UNC said it could not separate the immediate area around the statue from other security in the large quad, the figure came in response to a media query about Silent Sam. The figure is considerably less than the one listed in a memo to Chancellor Carol L. Folt from August 2017 in which Police Chief Jeff McCracken estimated the cost of guarding the statue against vandalism at about $620,000 annually — or $1,700 per day. The costs were part of the UNC Police operating budget and included personnel costs, such as overtime and contingency staffing, as well as operating expenses and assistance from outside law enforcement agencies. The University spent about $3,000 to clean the monument after vandalism during the fiscal year. There is a visible police presence near the statue most of the time, with officers walking the grounds or in marked cars parked on Franklin Street. While Civil War monuments have been removed on other campuses in the country in recent years, this statue is among those that have endured. The N.C. General Assembly in 2015 enacted a law that prohibits the removal or relocation of publicly sited monuments without the permission of the N.C. Historical Commission. After the August protests, which followed closely after racial violence in Charlottesville, Va., campus officials hoped to be able to take it down for safety reasons. Gov. Roy Cooper ’79 (’82 JD) said University officials were within their right to remove the statue if they perceived an immediate threat. UNC interpreted that differently, saying it did not have the authority. Most of the 28 speakers at a listening session held by the UNC trustees in November 2017 said Silent Sam is both a symbol of evil and now a threat to safety. The safety threat claim is broadly misunderstood by the public, particularly those outside Chapel Hill. In May, Little staged her own protest, pouring red ink and what she said was her own blood on the statue in the full presence of police. She was arrested and charged with defacing it.